Tonight I closed the gap behind Emsingen in the backdrop painting, and test-placed a few trees to see if my idea of letting tracks disappear into the scenery is going to work. I think it will. Makes me happy. I re-confirmed that I need to be in the right mood to paint, and waiting for that mood to appear is better than forcing it for the sake of making progress. 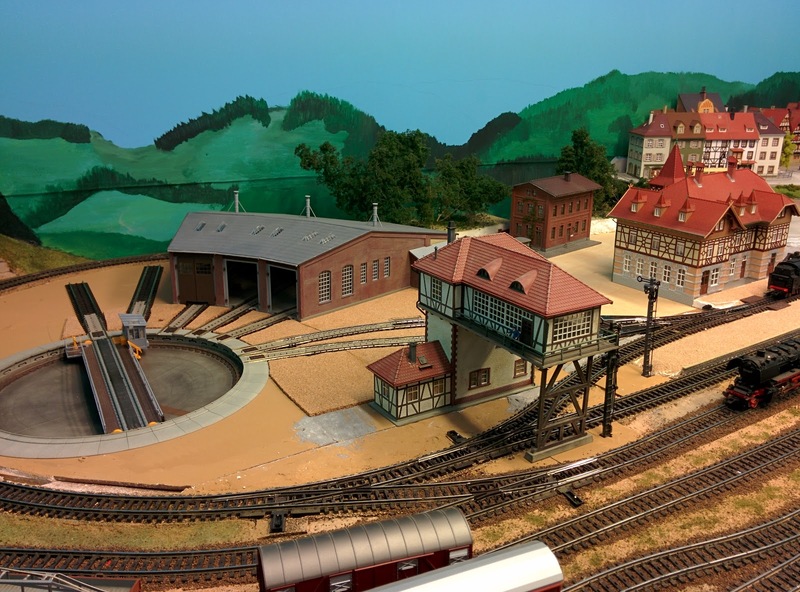 I finished wiring up the service facility and connecting it to the rest of the layout. All tracks have power. The three-way turnout works as designed with single button control and Logix in JMRI. I spent some time laying out the footprint for the coaling station. I will draw parts from a Faller kit to build the coaling crane, but the coal bunker will likely be scratchbuilt.